One small chip may put an end to animal testing by letting researchers gain realistic test results from a fusion of microcircuits and cell samples. 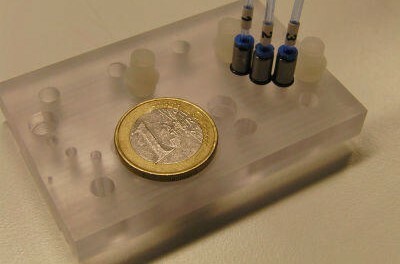 The “mini-organism” housed inside a chip was developed at the Fraunhofer Institute for Material and Beam Technology in Dresden, in cooperation with the Institute for Biotechnology at the Technical University of Berlin.The chip faithfully replicates complex metabolic processes in the human body with “mini-organs,” human cell samples from various organs, obtained through blood donations. It can be used to test both the active ingredients in new medications and to study cosmetics for their skin tolerability. “Our system is a mini-organism on a 1:100,000 scale to the human being,” said Dr. Frank Sonntag of the Fraunhofer Institute. This is an improvement upon existing cell sample technology. (http://www.mdtmag.com/news/2014/06/photos-day-cancer-metastasis-chip) The “mini-organs” are connected to one another through tiny fluid channels, which simulation human blood circulation. Working much like the human heart, a micro-pump transports cell culture medium through these canals. Engineers at the institute created smaller microfluidic systems than ever before, with a pump capable of channeling less than 0.5 microliters per second. This means the relationship between cell sample and liquid media is authentic,” Sonntag said. The system also ensures a constant cell of cell culture medium: like human blood, the medium flows continuously through the entire circuit. This is important since some types of cell can only present authentic “body-like” results if they are experiencing a current or flow. In order to test a product, the scientists can load the appropriate cell samples – such as those of the intestinal lining for medicine designed to enter the blood stream there – onto the chip. Since the metabolic responses are processed there just as they would be in the human body, the scientists can see which processes occur in which cells, and what branching effects that may have on other cells. Ultimately, this method is even more predictive than animal testing, because the effects on a body of a mouse or a rat cannot be applied to human beings exactly. Some companies in the cosmetic industry already use the artificial organism for testing. The Institute’s artificial organism was awarded the animal safety research prize in 2014. Sonntag sees other potential applications for the mini-system too. “We know today that certain kidney cells, the endothelial cells, play a key role in almost every kidney disease. With the in vitro tests to date, there was always the problem that the endothelial cells worked only under current. Here, our multi-organ chip could offer a test environment that would allow you to observe how cells regenerate following an injury,” he said.